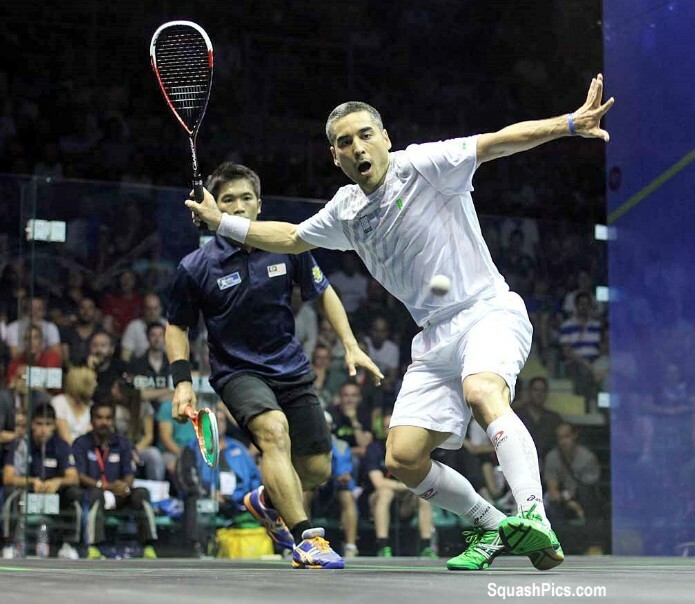 Egypt, England, Australia and hosts France will contest the semi-finals of the WSF Men’s World Team Squash Championship for the fourth time in a row after surging through the quarter-finals of the biennial event being staged in France for the first time in its 46-year history. 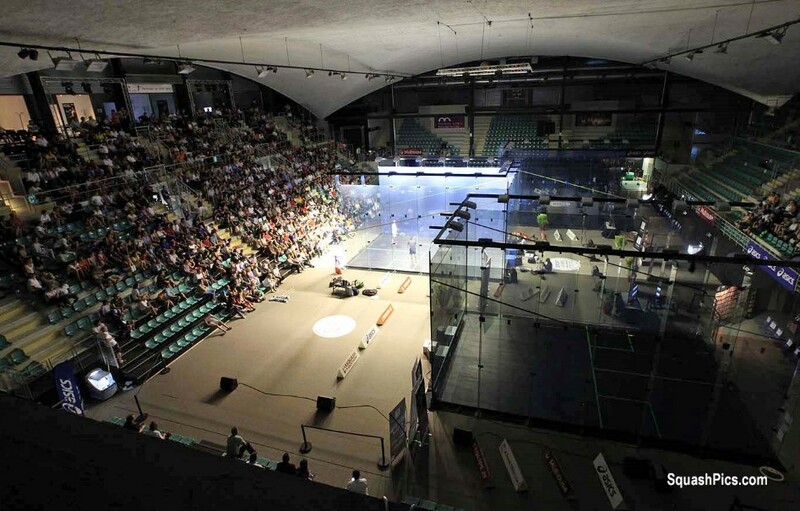 31 nations are competing in the 24th edition of the championship at two venues in Mulhouse – the Espace Squash 3000 Centre and the Palais Des Sports where, for the first time, play is taking place simultaneously on three ASB all-glass showcourts spectacularly lined up side-by-side. Favourites Egypt, looking to become the first nation since 1987 to win the title three times in a row, brushed aside eighth seeds India 2/0. Karim Darwish, the world No5 making his seventh successive appearance in the championship, defeated Harinder Pal Sandhu 11-7, 11-4, 11-2 – then world number one Ramy Ashour recovered from game-ball down in the fourth to beat top-ranked Indian Saurav Ghosal 11-7, 11-9, 4-11, 13-11 in just over an hour. “It’s my seventh time in a row in these championships and I am pleased to win today to put Egypt into a strong position in this tie,” said 31-year-old Darwish. “There are a lot of problems back in Egypt – if we win it’s the least we can do for our country to make the people happy. It would be great for our people. After clinching victory for Egypt on the centre court in the hot Palais Des Sports, Ashour said: “The conditions out there were incredibly tough – it was exhausting physically and mentally. It felt like my 758th match of the year! It took me a long time to warm up. “I really wanted to play Saurav today – I knew it would be a good game. I definitely lost a lot of calories. 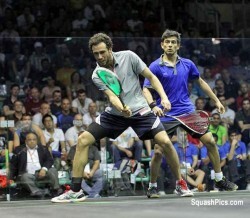 After coming so close to taking the world’s top player the full distance, Ghosal said: “Ramy is so unbelievably good – and at the same time so random. That’s what makes him so special. “I was about 8-4 up in the second and should have won it. 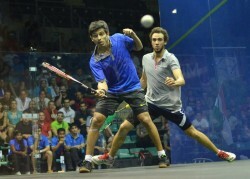 But the trouble with Ramy is that he can reel off points so quickly – and that’s what he did. “I played really well in the third and he dropped off a bit towards the end. 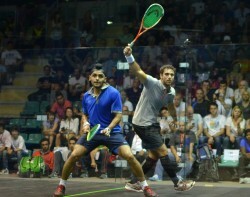 In the fourth Ramy had match balls at 10-8 – then I had a game ball at 11-10. But he played a great shot to win the match. “But I’m very happy with my performance – even though disappointed not to take the second,” added the UK-based world No20. “I’m not saying I could have won it – but I would like to have taken it to a fifth. Egypt, winners of the title three times since 1999, will now face eight-time champions Australia. 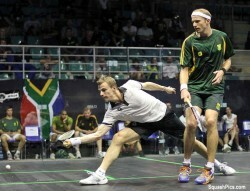 The fourth seeds beat Germany, the No6 seeds, 2/0. In fourth successive victory this week after coming out of retirement, former world champion David Palmer beat rising German star Raphael Kandra 11-9, 11-4, 13-11 – before squad number one Cameron Pilley held off a spirited challenge by Simon Rosner to upset the higher-ranked German 11-3, 14-12, 11-5. A rejuvenated Palmer said after his win: “I felt good in the first two games but, all credit to him, he came back – he just didn’t give up. He’s a flashy kind of player – some incredible shots but also some errors. Hosts France, the third seeds, will meet their stiffest challenge of the tournament so far when they take on former champions England in the other semi-final. 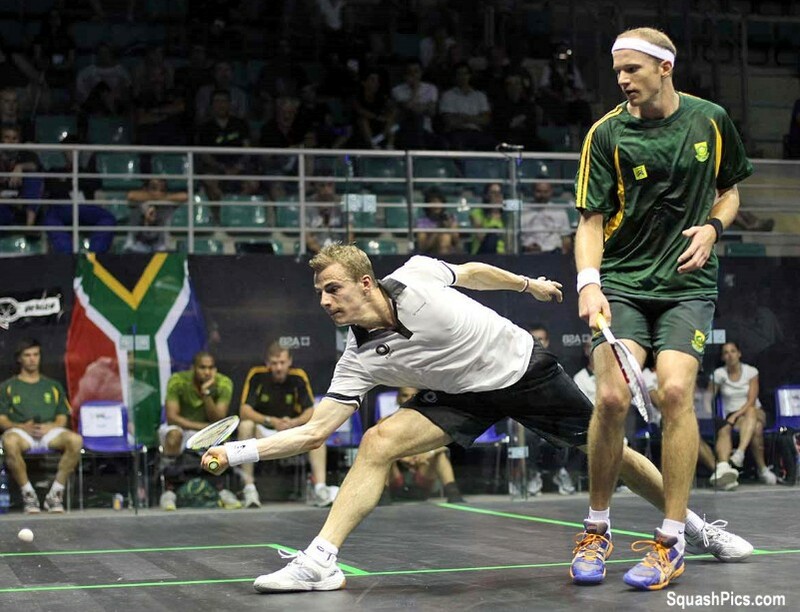 Second seeds England faced tournament dark horses South Africa, and beat the No7 seeds 3/0. World No3 James Willstrop put the team in the driving seat after defeating South African number two Shaun le Roux11-7, 11-6, 11-8. 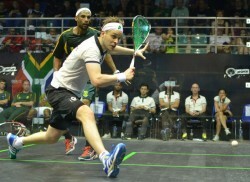 Fellow Yorkshireman Nick Matthew then stepped up to take out Stephen Cop pinger, South Africa’s highest-ranked player for more than two decades, 11-4, 11-4, 11-7. 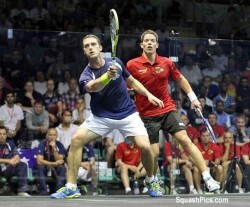 In the best-of-three dead rubber, Daryl Selby beat veteran Rodney Durbach 11-7, 11-6. “South Africa weren’t just here to make up the numbers – they are capable of playing above their ranking and we treated them with respect they deserved,” said Matthew, the world No4. “Especially Steve – he’s improved a lot recently. “It was really important for me to win today as I’ve had a couple of rest days – in preparation probably to play the best two players in the world – and I didn’t want to let the team down after what they’ve done to get us here. “It’s set us up nicely for the semis – where we expect to play France in front of a partisan crowd, which will be brutal! We’re all experienced players – James and I both have around a hundred caps each for England – so we play the opponent, not the atmosphere. We’ve both won a couple of world teams – even though a long time ago now! “I’ve only really lost two matches in six championships since 2003 – and I’m proud of that record. 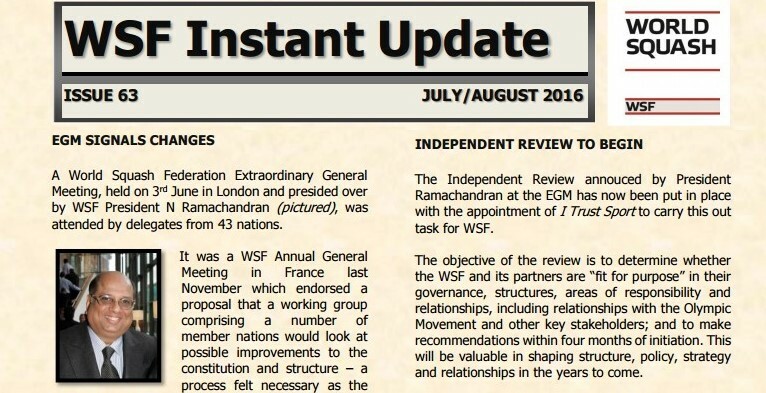 France rounded off the evening by conquering Malaysia 3/0. Thierry Lincou led the way by beating Mohd Nafiizwan Adnan 11-6, 8-11, 11-7, 11-7 before local hero Gregory Gaultier defeated Malaysian number one Ong Beng Hee 11-6, 11-6, 11-5 to take France into the semis. The packed crowd wanted more – and watched third string Gregoire Marche beat Sanjay Singh 11-3, 11-3 in the best-of-three dead rubber. 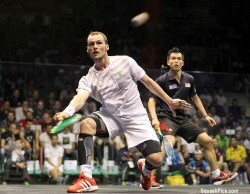 Gaultier, the world’s second highest-ranked player, was delighted to be involved with this historic championship: “It’s great to play in front of a home crowd. We don’t have many events in France – and when you see the quality of this event you are very happy. “I am very proud that my country has staged an event like this – I know the Federation has been working on it for more than a year, and they are really looking after the players. “I don’t feel any pressure – it’s a pleasure to be playing for my country. I have been playing for so many years that I feel I am experienced and mature enough to deal with the pressure. 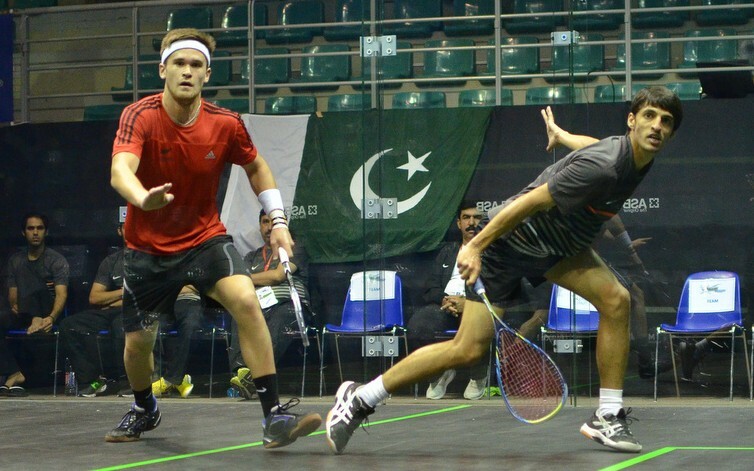 In the play-offs for 9th-16th places, former champions Pakistan upset New Zealand 2/1 to ensure a significantly improved finish after last year’s shock 21st place. “We are here to restore pride in squash in Pakistan squash after our lowest ever finish last time,” said Pakistan coach Jamshed Gul. “I am proud of my young team for this win today and now we can look forward to playing for a place in the top 12.